Resistance: Retribution has been getting a lot of love for taking all the features of a console game and transporting it to the handheld realm of the PSP. The fellows at Sony Bend have done a great job indeed of cramming a huge amount of content into the game and providing the kind of action you'd expect to see on a PS3, up to and including online play. 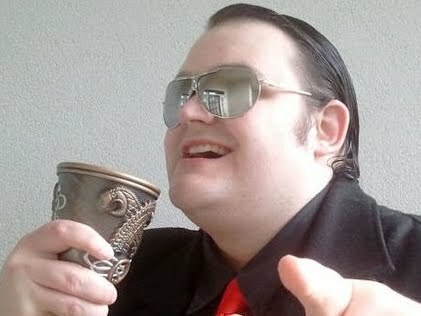 That said, have those waxing poetic about this game been simply dazzled by the amount of content and not the content itself? Our review is a little late, but it's given us the benefit of hindsight and it's certainly my belief that Retribution, while definitely not a bad game, has been given a bit more praise than it deserves, simply because it's on the PSP. This is no rudderless claim, so read on for the full review of Resistance: Retribution. Retribution leaves behind Nathan Hale from the first two console games to focus on a brand new hero, James Grayson. A hardened soldier, Grayson turns his back on the army after being forced to kill his own brother, who had been taken by the villainous Chimera and "converted" to serve their purposes. Since that traumatic moment, Grayson went AWOL and started bombing Chimeran conversion centers, before being arrested and sentenced to death. However, a European resistance group known as The Marquis intervenes, sparing Grayson's life for a typically daring and dangerous mission. The story is decent enough, but it's impossible to take seriously thanks to the rather bad dialog and some of the most ridiculous voice acting I've heard in a while. Grayson attempts to sound like a grizzled war veteran, but his gruff English accent is ludicrous and the script is clearly written by people who don't know how real British people sound. It doesn't help that Grayson is xenophobic and misogynistic, as well as arrogant and stupid, which makes him very hard to get behind as a main character. 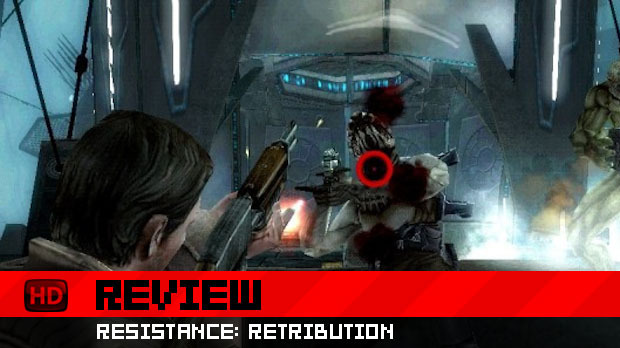 In significant departure from previous Resistance titles, Retribution takes the form of a third-person over-the-shoulder shooting game, eschewing the traditional FPS perspective in favor of something that fans of the PSP SOCOM games will easily recognize. As with Sony Bend's other handheld outings, Grayson is moved with the analog nub while he aims with the face buttons. It's a concession to make up for the lack of twin sticks, but it's a concession handled well, and the game controls quite fluidly, helped along with an incredibly forgiving auto-aim. Unfortunately, while the basics are excellently implemented, the gameplay itself is a bit of a let down. 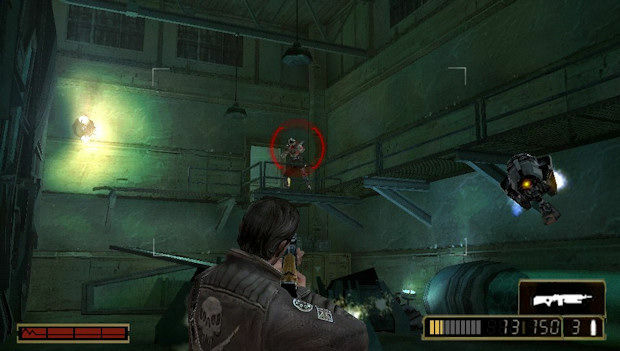 For a start, the action is cover-based, but it seems that the developers realized the game would be too easy if Grayson just hid behind cover and auto-aimed for the whole game, so Retribution consistently breaks its own rules in a rather sorry attempt to appear challenging. 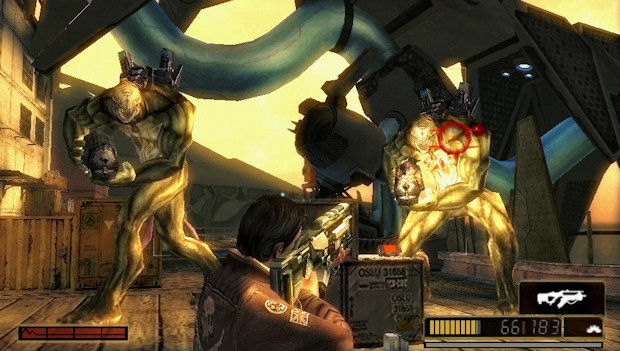 The Chimera frequently break from cover and charge Grayson's position, either to surround him or beat on him with melee attacks, and Grayson is woefully unequipped to deal with anything outside of long-distance firefights. There's nothing more annoying than a cover-based shooter tossing out enemies that break the rules for a cheap win, and Retribution does it constantly. As well as regular Chimera that charge you whenever they feel like it, there are enemies known as Boilers, which require you to awkwardly switch to manual aim and shoot their heads before they explode, giant enemies with area-of-effect weapons that can shoot behind your position to kill you with splash damage, and drones that will shoot from overhead and blow up in your face should you damage them enough. Retribution perfects the art of the cheap death. It's a shame that Sony Bend felt the need to do this, because the actual cover-based fighting is well crafted. 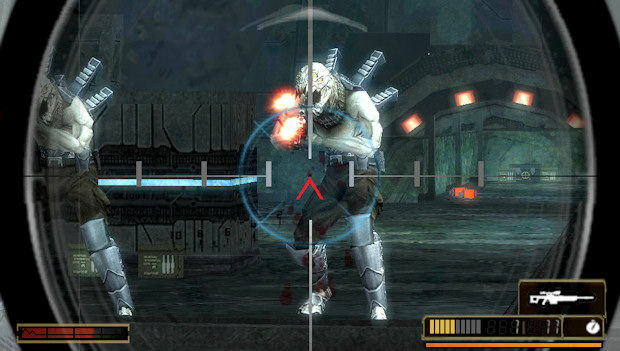 Grayson will automatically aim at anything that appears within a centered on-screen box, and the combat, when it plays properly, is all about timing when you pop out from cover and fire at the Chimera. This system works quite well, although the auto-aim does have a tendency to get incredibly confused when dealing with multiple enemies, and naturally likes to target the least threatening enemy first, ignoring those that are a foot away from you and shooting your face off. If this was the only problem with the game, that wouldn't be so bad, but it sadly helps to impact the game's other flaws. When Retribution is actually playing fair and the targeting decides to work, there lies hidden a fairly decent shooter that can provide some solid portable action. It's just sad that these satisfying moments are few and far between. 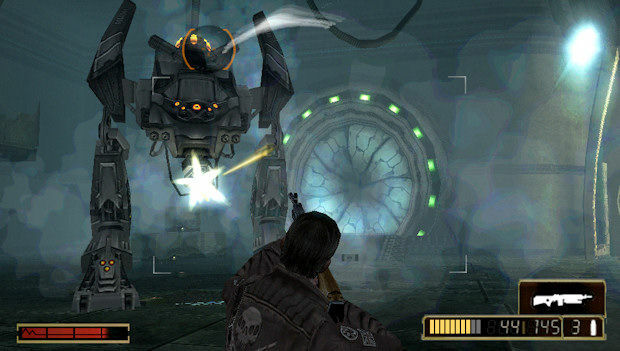 The game can also be credited for a number of sections that stray from the cover-based staple, such as a pretty cool mech level and several empowering turret sequences. Getting behind a shielded railgun and raining down justice on the Chimera is satisfying, although the sudden switch to analog control for aiming is jarring and catches one off guard. 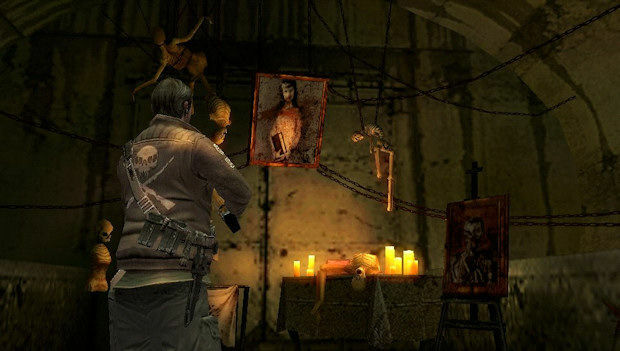 Players with Resistance 2 will be able to use their PS3s to "infect" Retribution, which will add a magnum and regenerating health, as well as change a few cutscenes along the way. Be warned that the game will not remember the infection, and you'll need to reconnect the PSP to the PS3 if you ever power down. However, it's a neat extra feature that fans of the console games should dig. On the subject of extra features, Retribution provides a fully functional online multiplayer mode, complete with everything you'd expect on a console. Lobbies and voicechat are all present and correct, truly providing the feel of a miniaturized console multiplayer game on the PSP. The gameplay itself is rather clunky, especially with the auto-aim turning each gunfight into a button masher where luck decides the battle over skill, but the game is still being actively played with over 300 players online when I checked it out. That counts for something, and hints that online multiplayer might be a more worthy venture on the PSP than it's given credit for. If this game does one thing consistently right, it's provide some high production values. I can't take anything away from the rather pleasant graphics and the very excellent soundtrack, which has an almost BioShock quality to it, and remains a sinister presence throughout. A lot of effort has clearly been put into making this game look and sound as much like a home console game as possible, and the effort shows. Taken as a whole, Resistance: Retribution is a game with incredibly high ambitions, let down by a number of poor decisions. The game succeeds in bewitching players with its aesthetic quality and impressive volume of content, but the flaws are constantly remind you of their existence and sadly drag the whole production down. The potential was fantastic, but it's potential not used, and while fans of the series will most likely get a lot of enjoyment out of the game, Resistance: Retribution is not a title that will rope in newcomers.